Sea Kayaking Anyone? What you need to take! Kayaking is one sport that can both extremely serene or extreme in a matter of minutes. But either way, it is very spiritual no matter how you look at it. When you are paddling around in the ocean, the feeling is completely different. You might as well be on an alien planet, going adventuring and exploring with your trusty kayak. • Don’t start out on the sea. It is best if you start in smaller waters, maybe take a lesson or two to get the basics down. When you are in a river, God forbid if something goes wrong, chances of making to the shore are pretty high, but the sea is another story. It is not for the faint of heart will take some actual muscles to properly enjoy all it has to offer. • Practice as much as possible. The sea is a harsh mistress, or so they say. • Before you even think about going in the water, pick out your route. It doesn’t have to be very exact, but you must have a general idea of where to go. • Check the weather! It is very important to look at several different weather forecasts just in case. • Stay out of foggy areas. The further, the better. It is extremely easy to lose sight of the shore, and you might end up much further away than you ever intended to go. • Bring a map, and a friend (or several). Especially if you are new to sea kayaking. Having a few extra people will only give you some peace of mind but also keep you company during what could be a long journey. You can also go sea fishing on a kayak. Although it is much more difficult than going fishing on the freshwater but is just as much enjoyable. Try to use a fish finder on kayak like the Dragonfly 4 Pro which comes with a built-in GPS and a sonar that has a range of up to 1000 feet. It costs only $272.26 at the moment, which si the best your money can buy in this price range. 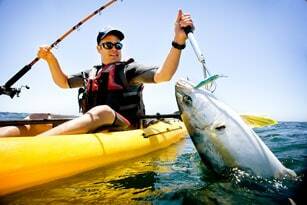 You can also opt out for some extra sea kayak fishing gear like custom made fishing rods, hooks, as well as some amphibious shoes, swimsuits, don’t forget a water bottle, even though you are surrounded by water, not one bit of it is drinkable (as I am sure you already knew, but just in case). Also, bring a hat for shade, it gets really hot out there in the sun, and you will be roasting like a potato in no time, some sunscreen, and waterproof clothes. Just some common things that you probably already knew about. Depending on your budget, a good kayak brands product can cost anywhere from a few hundred to several thousand dollars. The Riot Kayaks Edge 14.5 is a beast and is available in an extremely adorable price range. Sport Fisher Kayak brand is another trustable name in the industry with a multitude of products for all kinds of kayak enthusiasts.